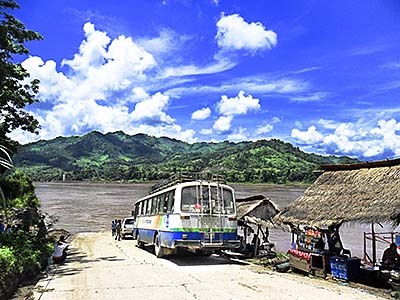 The province of Sainyabuli covers a large valley, including parts of the Luang Prabang Mountain Range in the west and another mountain range east, which separates it from Vang Vieng and the Nam Song Valley. Through the wide, green plains runs the Mekong River. The city of Sainyabuli is the province capital. Sainyabuli is quite isolated from it's surroundings. 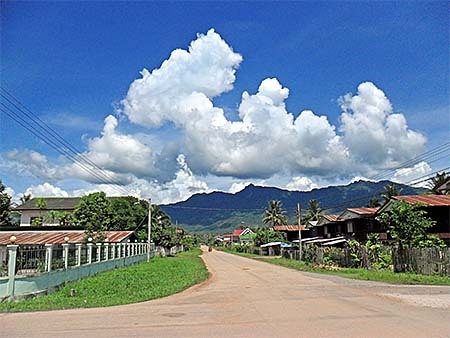 There is only one asphalt road coming from Luang Prabang and leading southwards to Sanakham at the Thai border to Loei. 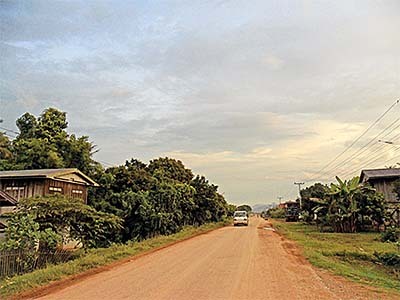 From Sanakham leads a road connection to Vientiane. 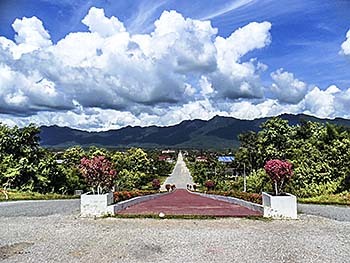 There is no paved road connecting Sainyabuli with neighbouring Nan Province in Thailand. In the wide Mekong plains is most of north Laos' rice production concentrated. The other northern provinces of the country are too mountainous to produce amounts as large as here. Other agricultural products from Sainyabuli Province are maize, corn, oranges, cotton, peanuts, sugar cane, various vegetables and sesame. The province is also still half-way rich in forests, although logging destroys the natural surroundings in an increasing speed. As usually, also here the national military is involved into (illegal) logging. Who can stop the military doing that? A great issue in the province is the construction of a large, controversial megadam on the Mekong River about 30km out of Sainyabuli town. In the province of Sainyabuli live the most remaining (domesticated) elephants of Laos. There is an annual elephant roundup in Hongsa, an event which get's more and more touristic these days. However, in the border region to Thailand still live some elephants in the wild. The area is also very rich in birds. The Mekong catchment area is anyway among the richest regions in terms of biodiversity in the world. That comes with a large number of different and often rare plants who grow here. 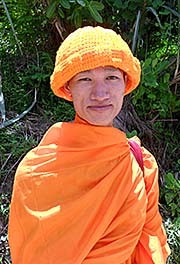 As everywhere in Laos north, a great deal of the human population are hill tribes. There are the Hmong, the Tai Lue, Akha and many more to name. One of the last remaining hunter-gatherers in Southeast Asia, the Malabri, are also living in the remote parts of Sainyabuli Province. The real attraction of the province is the remoteness itself. 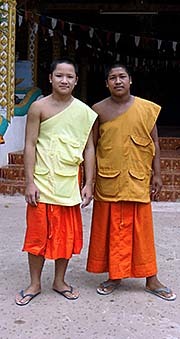 There are no big landmarks in the area, only a few Buddhist temples, waterfalls and caves. However, the Sanyabury Dam will change things considerably, and a planned power plant in Hongsa means another large cornerstone in the industrialization of the province. The name 'Sainyabuli' is just one way to spell it. There is no standard in translating Laotion language into Western script. There are many other spellings in use, one of them is Sanyabury. After the downfall of Ayutthaya (1767) and king Taksin's conquest in the east, the Laotian kingdom became a vassall state of the kingdom of Thonburi in 1779. Part of the territory became French after 1883, and the Mekong River became the border between Siam and 'French Indochina' until 1904, when the French appetite for more land forced also Sainyabuli out of Siam into the French colonies. In the Second World War, after a Thai military expedition against the French, Sainyabuli came to Thailand again. After the war, in 1946, it was given to France again, though. About 20km southwest of Sainyabuli lies a little spot with the name Phiang (Muang Phiang). It's not much more than a number of buildings, mostly private houses, along the main road, what is National Road 4. The place is surrounded by rice fields. At the western and easter horizons are the mountain chains to see who border the Mekong valley here in this green oasis. When leaving Sainyabuli in summer 2011 on the way to Vientiane, I found little public transport southwards. I decided then to a combined walk and hitch-hike. Since Phiang has at least one guesthouse, I decided to laze out there until next day. This article is based on two visits to Sainyabuli. For the theoretical background, have a look on the Literature page. 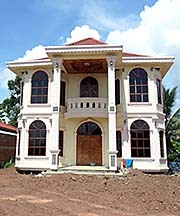 It comes together with articles from newspapers, magazines, (qualified) websites and movies. Sainyabuli is often in the news not as a place or province, but for the huge dam construction site in the province and it's severe impact for the nature and people who get's displaced.